Progressive Charlestown: Will we end up with the worst of worlds? Will we end up with the worst of worlds? The White House war between Stephen Bannon and Jared Kushner wouldn’t matter in a normal administration with a normal president. But there’s nothing normal about the Trump White House, whose major occupant exists in a giant narcissistic bubble impenetrable by anyone but close relatives and a few strong personalities. Kushner is his trusted son-in-law, a 36-year-old scion of New Jersey and New York real estate who knows nothing about government but a great deal about Trump, and whose portfolio of responsibilities keeps growing by the day. Bannon is the rumpled hero of the anti-establishment populist base that drove Trump’s Electoral College victory, but who appears to be losing clout. 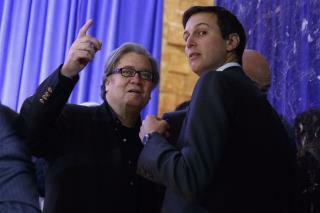 The fundamental difference between Kushner and Bannon is over populism. Kushner is a politically moderate multi-millionaire with business interests all over the world – some of which pose considerable conflicts of interest with his current duties – and who’s quite comfortable with all the CEOs, billionaires and Wall Street moguls Trump has lured into his administration. Bannon hates the establishment. “There is a growing global anti-establishment revolt against the permanent political class at home, and the global elites that influence them, which impacts everyone from Lubbock, Tex., to London, England,” he told the New York Times when he took the helm at Breitbart News in 2014. If Bannon meant trimming back regulations emanating from administrative agencies, it’s an idea that Wall Street and CEOs love. Trump has wholeheartedly embraced it. “We are absolutely destroying these horrible regulations that have been placed on your heads,” Trump declared last Tuesday to a group of enthusiastic chief executives from big companies like Citigroup, MasterCard, and Jet Blue. But Bannon actually meant something quite different. To Bannon, “deconstructing the administrative state” means destroying the “state” – that is, our system of government. Under Bannon’s tutelage, Trump has attacked the core institutions of American democracy. He’s lashed out at judges who disagree with him; called the press the “enemy of the American people;” denigrated fact-finding groups such as the intelligence agencies, the Congressional Budget Office, and government scientists; alleged without evidence that his predecessor wiretapped him; and repeatedly lied about his electoral victory. And rather than support a full and independent inquiry into whether anyone in his campaign might have conspired with Russia to interfere in the 2016 election, Trump has done everything he can to subvert it. Does Bannon’s recent demotion and Kushner’s promotion mean we’ve seen the end of these sorts of attacks? I doubt it. After all, Trump originally embraced Bannon because Bannon gave Trump exactly what Trump has sought for decades – controversy, screaming headlines, and, above all, the appearance of being an irreverent outsider who rejects politics as usual and rattles Washington to the core. So it’s doubtful that either Bannon or Kushner will emerge the winner. They’ll both continue to advance their own views and agendas in Trump’s chaotic White House. Bannon’s brand of anti-establishment populism that seeks to undermine the core democratic institutions of government, and Kushner’s oligarchical Republicanism that empowers and enriches CEOs, Wall Street, and billionaires. Americans hate big money in politics, but have deep reverence for the institutions of government – the Constitution, the Bill of Rights, an independent judiciary, the office of the president (regardless of who inhabits it), freedom of the press, the right to vote, and the truth. Americans are rightfully incensed that the system is rigged against them. But they’re angry at the riggers – not at the system. Yet Kushner will protect the riggers and Bannon is out to destroy the system. And Trump is quite happy to do both.